Hull player-coach, Jason Hewitt. Picture: Lois Tomlinson/Hull Pirates. JASON HEWITT will be looking for a swift reaction from his Hull Pirates team as they look to bounce back from their midweek loss at leaders Telford. Having enjoyed two wins in his first weekend as the Pirates’ new player-coach, Hewitt for the first time experienced the other side of the coin in his leading role in Wednesday night’s 6-2 defeat. Hull Pirates and Sheffield Steeldogs are both looking for a positive reaction this weekend. Picture: Lois Tomlinson/HullPirates. The former Sheffield Steelers and GB forward and his players face another tough night with their last visit of the regular season to Basingstoke Bison. Two previous visits have left the Pirates empty-handed, but they will probably fancy their chances more of picking up points when the two sides reconvene in Hull on Sunday night, the East Yorkshire side having won both previous encounters against the Bison on home ice. 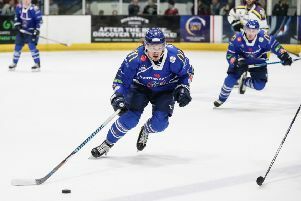 Sheffield Steeldogs will be hoping home comforts can give them a timely lift as they strive to reboot their campaign in order to carry some decent form into the play-offs. Like his counterpart at Hull, Steeldogs’ player-coach Greg Wood will be hoping his players can respond to last Sunday’s 8-3 defeat at home to title-chasing Milton Keynes, a game which was lost by the end of the first period when the visitors had already gone 4-0 up. Since then, the South Yorkshire club - who remain in the eighth and final play-off spot, nine points ahead of Bracknell Bees - have signed teenage defenceman, Lewis Baldwin. The 17-year-old became available following the collapse of Manchester Phoenix, who were forced to withdraw from the league after running into dire financial trouble. Wood, whose team host Peterborough on Saturday night before welcoming Guildford Flames on Sunday, said Baldwin’s arrival was in keeping with the club’s desire to build a core of young, British players that will remain in place for a number of years. “With the season closing out, it is essential we strengthen and build for the future - Lewis is certainly part of that plan,” said Wood. “As a club we are doing everything to build a solid base of young players that we can use for years to come. At the start of the season we knew this would be a transition season with so many changes. Baldwin, who contributed one goal and two assists in his 37 games with Phoenix, added: “I was uncertain about where I was going to go. ** Hull Pirates will play Sheffield Steeldogs for the Bradfield Brewery Cup. The first leg will be played at the Hull Arena on Sunday, Feb 19 (5.30pm), while the second leg will be played at Ice Sheffield on Friday, March 3 (7.30pm).